ååll for Sunstar Japan - ååll is a new line of hair care and oral care products for Sunstar. The line proposes new concepts for hair shampoo and conditioner containers, a toothbrush and an oral tablet. ååll products are inclusive. The line is designed for everyone, including low vision, blind and physically impaired people. ååll shampoo and conditioner are a set of flexible containers. 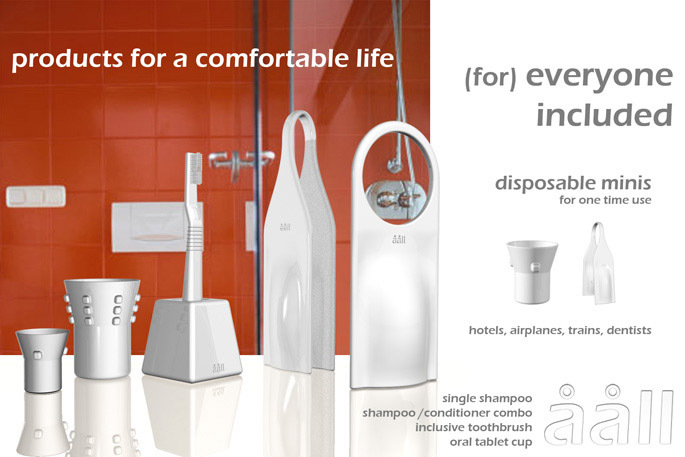 Shampoo and conditioner become part of the bathroom landscape or can be carried as fashionable accessories in public. The containers can be hung over fixtures to give them a fixed place and to facilitate liquid dispensing. Multiple containers can easily be carried with only one hand. ååll toothbrush is a disposable toothbrush which contains a toothbrushing liquid. When the brush is inserted into the mouth, the liquid is sprayed through the bristles with the push of a button. Through brushing, the liquid turns into a foamy paste. ååll toothbrush can be used in conjunction with a refill base. The toothbrush is inserted into the base for daily storage. To refill, the toothbrush is pushed down into the base and liquid is pumped up from the base into the toothbrush. ååll oral tablets are mouthwash / toothpaste monodoses. 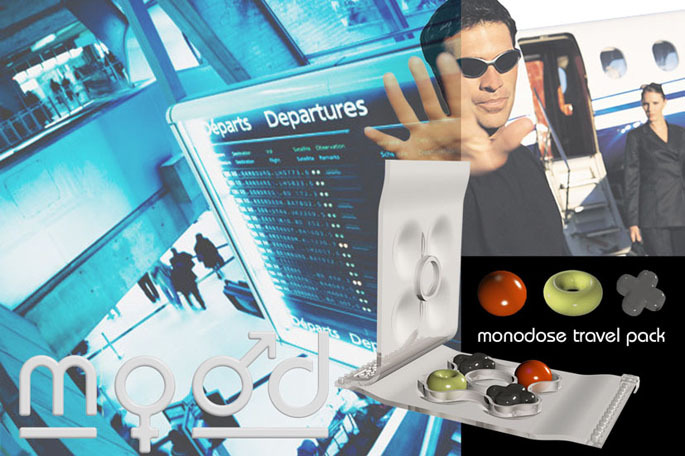 A number of tablets are enclosed in the upper part of a disposable plastic cup and can be released into the cup by pushing the tablet from the outside. The released tablet dissolves in the cup in water, forming a liquid toothpaste / mouthwash. The mouthwash is taken in and spit out. The liquid, remaining in the mouth, turns into a foamy paste when brushing the teeth. PIZ for Dietiker Switzerland - PIZ is an upholstery material sandwich, suspended within a metal frame. The sandwich consists of a lasercut honeycomb core between a top and bottom layer. The cavities of the core are filled with scrap foam pieces. The layers are fastened by stitching. The laser and the stitching path are computer guided and can vary indefinitely, creating industrially produced pieces with a one of a kind feel. of belonging, the sharing of emotions, experiences and information. Interaction can be an intimate exchange between two people or a networking experience among a group of people. SHARING allows people to connect. 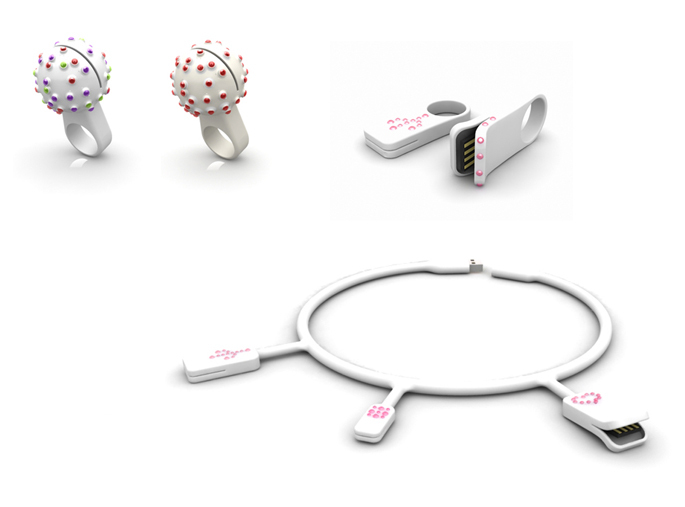 Connect to each other via two rings or to connect to a network via a necklace. PICTURINGS - PICTURINGS and PICTUCHARMS play with the idea of wearing our memories on our body. We cherish memories and we record our memories in photographs and by collecting objects as souvenirs. 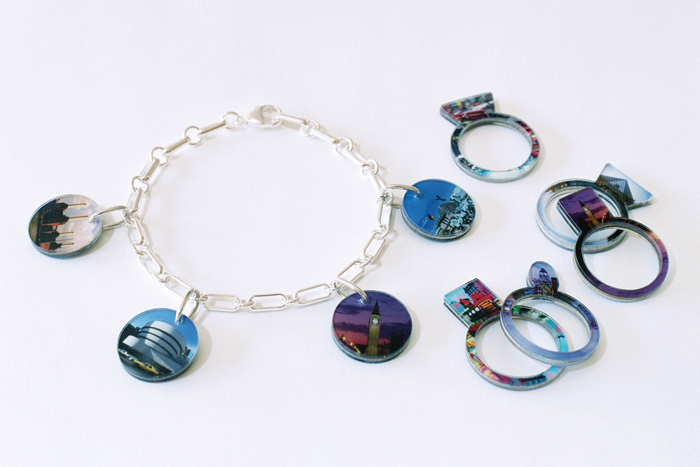 PICTURINGS and PICTUCHARMS is a series of individual photo jewelry. Choose individual rings and create your own memory / souvenir ring. Spread on the finger, you display the pictures, closed you keep them private. Add charms to your favorite necklace or bracelet or start a new one. Collect memories. 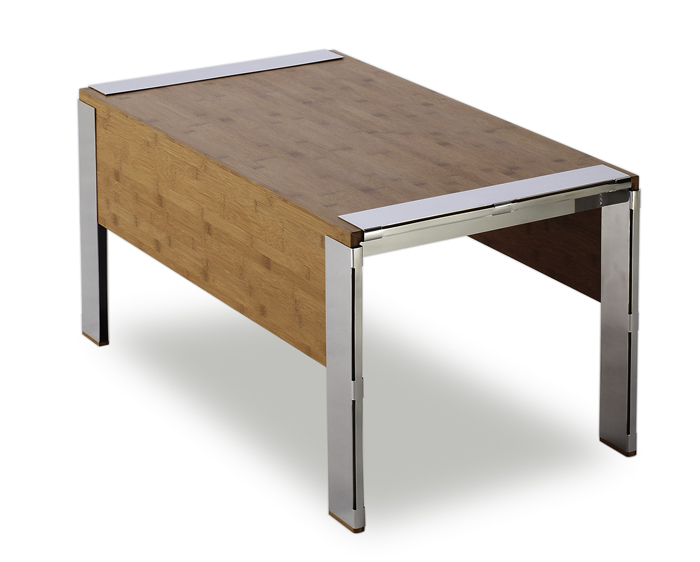 S3 Sofa Table - S3 is a sofa table which connects the table legs to the table top without the use of any fasteners, making set up and take down very easy. The table legs are constructed from lasercut sheet metal, bent into a channel profile. Cut-outs in the sheet material are design features as well as functional elements.The table top press-fits into the leg profiles and is stabilized through tension. The sides of the table top give stability, reminding of a table cloth, draping over the table. 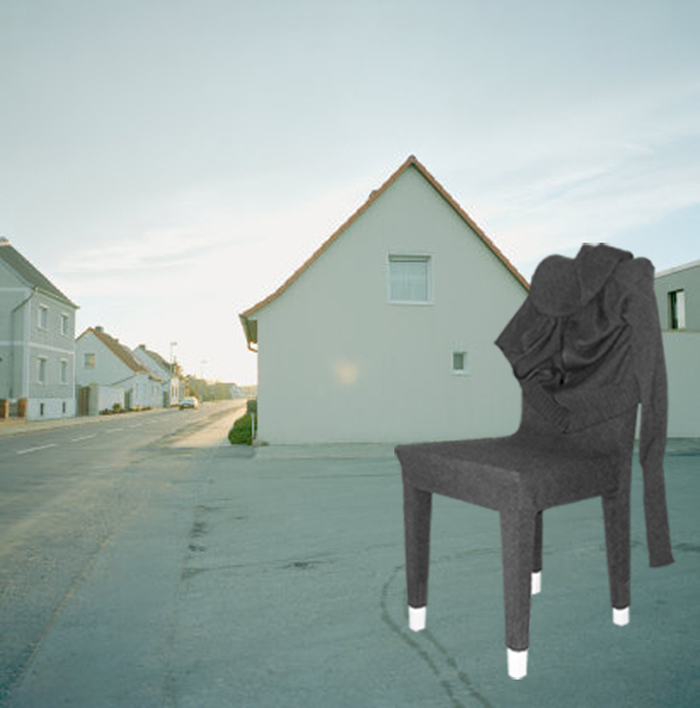 Ready To Wear Chair (RTW Chair) - rtw chair is the materialization of a contemplation process on the impact of clothing. Why do we wear certain labels or hide behind the very same ? Desire of belonging or wish to express our individuality ? rtw chair is a response to the increasingly alienating spaces of contemporary urban life, the lack of privacy and personal address. It is a step back from our high-tech reality towards simplicity in material and meaning. Going back to the basic human need of warmth and security - an embrace. 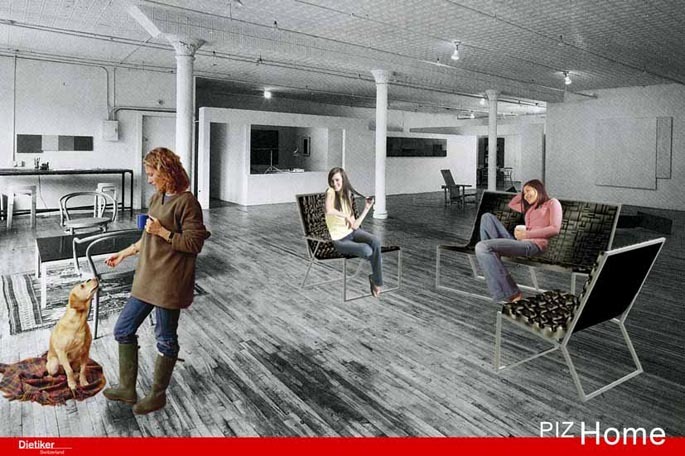 SITCITY - SITCITY is a concept for reversible public seating constructed from recycled inner tubes. Using minimal low cost materials to create large user volume, SITCITY is particularly interesting for public spaces in low income urban areas, playgrounds and educational institutions as well as events and exhibitions. Lightweight and quick to set up, SITCITY is suitable for temporary installation and use. 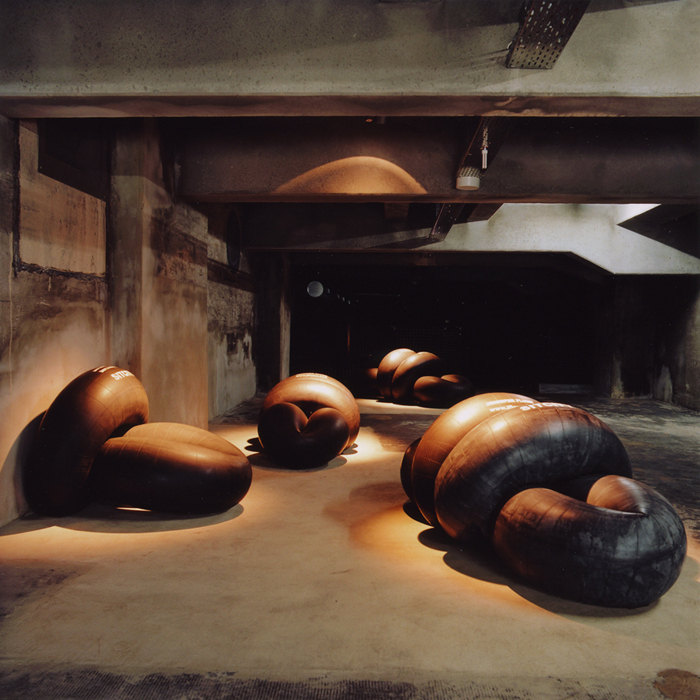 Design variations in the configuration of the inner tubes create various possibilities of use.